“It will strengthen the middle class, and create good, well-paying jobs and new opportunities for the nearly half billion people who call North America home,” Lighthizer and Freeland added. The last-minute deal will provide U.S. with greater access to Canada’s dairy market, an issue that had been considered vital for U.S. dairy manufacturers, a senior administration official told reporters. For the first time, the agreement specifically addresses agricultural biotechnology to support 21st century innovations in agriculture. The text covers all biotechnologies, including new technologies such as gene editing, whereas the Trans-Pacific Partnership text covered only traditional rDNA technology. Building on NAFTA, the United States, Mexico, and Canada agreed to work together on agriculture matters, improve transparency and consultations on matters affecting trade among the countries. Canada represents the second-largest market for California agricultural exports, with sales of more than $3.3 billion in 2016 – the most recent year for which full statistics are available. Mexico is the No. 5 foreign market for California farm products, with sales of just more than $1 billion in 2016. “On behalf of the Produce Coalition for NAFTA, we strongly commend the Trump Administration and the Trudeau Administration for reaching a significant agreement which will bring Canada into the U.S.-Mexico-Canada Agreement (USMCA). We sincerely appreciate the hard work of Mexican Economy Minister Ildefonso Guajardo in helping to ensure that this agreement was reached. This modernized trilateral trade agreement will enhance U.S. agricultural exports and build on the success of the NAFTA agreement that was put in place in 1994. The Produce Coalition for NATFA is made up of leading U.S. and Canadian fruit and vegetable companies that support efforts to modernize NAFTA, while maintaining duty-free access for produce among the NAFTA countries. The Produce Coalition for NAFTA believes important issues like border procedures, harmonization of regulations and the protection of intellectual property offer opportunities for real improvements in free trade. 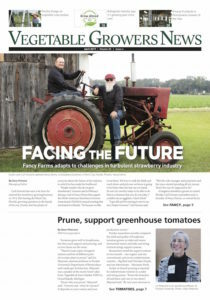 To learn more about the Produce Coalition for NAFTA, visit http://producecoalitionfornafta.com/. “The members of the Produce Marketing Association are pleased that negotiators have concluded discussions on an updated United States-Mexico-Canada Agreement (USMCA) on trade. A single agreement is the best way to address the extensive relationships and investments in produce and floral production and sales that have developed in North America. This agreement is consistent with our overarching goals of free and fair trade and we hope that the new agreement will be quickly ratified by all three countries. PMA is a trade association representing companies from every segment of the global produce and floral supply chain. PMA helps members grow by providing connections that expand business opportunities and increase sales and consumption. For more information, visit www.pma.com. “The Canadian Produce Marketing Association (CPMA) is pleased that a new trilateral free trade agreement has been reached between Canada, Mexico and the United States. The United States-Mexico-Canada Agreement (USMCA) will ensure that the supply chains of the fresh produce industry remain integrated benefiting both Canadian producers and consumers. CPMA will be reviewing the details of the agreement, particularly those chapters related to sanitary and phytosanitary issues, dispute resolution, trade remedies, good regulatory practices, and competitiveness. “CPMA looks forward to continued collaboration with Ministers Freeland and MacAulay on other key areas of trade which are focused on diversification and growth within the fresh produce industry,” said Ron Lemaire, CPMA president. The American Seed Trade Association (ASTA) applauds the news of a new trade agreement between the U.S. and its two largest export markets: Mexico and Canada. While ASTA is still reviewing the full details of the agreement, the association is pleased to see the language includes its core priorities for trade. Most notably, the agreement provides stronger support for agricultural biotechnology and the trait approval process; recognizes the importance of evolving plant breeding methods like gene editing; strengthens science-based sanitary and phytosanitary (SPS) regulations; and provides strong intellectual property protections, including adoption of UPOV 91 requirements.